MIT's RoboScooter Hopes To Fill The Role The Segway Hasn't | OhGizmo! Even with all the hype and hoopla behind the Segway, it’s yet to really revolutionize the way people get around. And while I’m a big fan of the Segway, I believe something like the RoboScooter from MIT’s Media Lab has a much better chance at replacing the automobile, particular for people who commute or who live in crowded urban settings. Made from just 150 parts, the RoboScooter should theoretically be easy to mass produce, and the simple design including lack of a complex drivetrain (each wheel has its own electric motor and suspension) would probably make it more reliable and easy to maintain. 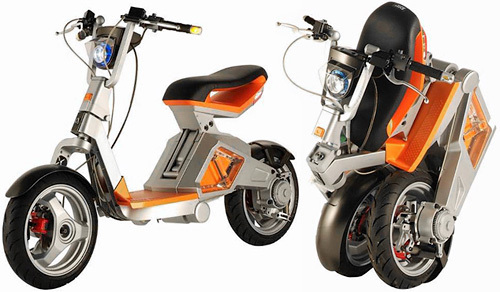 The RoboScooter would also make the streets considerably less crowded, and would reduce the need for large parking lots or garages since it’s able to fold up when not in use. It was jointly developed by Sanyang Motors, Taiwan’s Industrial Technology Research Institute and the Smart Cities group at the MIT Media Lab. And while the final prototype of the RoboScooter was actually shown at the Milan Motor Show in November, there’s been no word on when it might eventually be available to the public. The problem I have with the Segway is it doesn’t get you fast enough to your designation rationalize not walking. I think Segways would have have flew off the shelves if their speed was as fast and safe as a bike. This would work on so many levels here in London. It would avoid the congestion charge being both a scooter and electric, its size would avoid those hugely expensive parking bays and security issues as you could take it into the office and onto the train home and it would avoid you looking like a complete moron standing on one of those loopy Segways. A brilliant concept that should fly off the shelves if ever made commercial. If the folded up unit could follow you around like an obedient robot rather than you having to pull it like luggage it would be awesome.